On Valentine’s Day 2011, Martin surprised me with a homemade spaghetti dinner made on our brand new, shiny Marcato pasta maker. Since then, we’ve made fresh pasta on multiple occasions, sometimes herbed, sometimes thinner or wider strands, but always a long, ribbon-cut noodle. 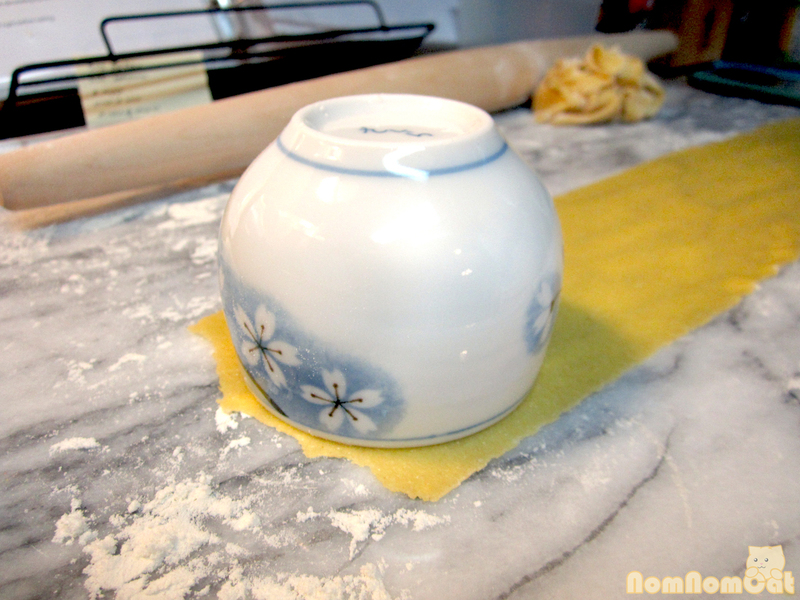 It felt like a distant dream to be able to make shaped or filled pastas. 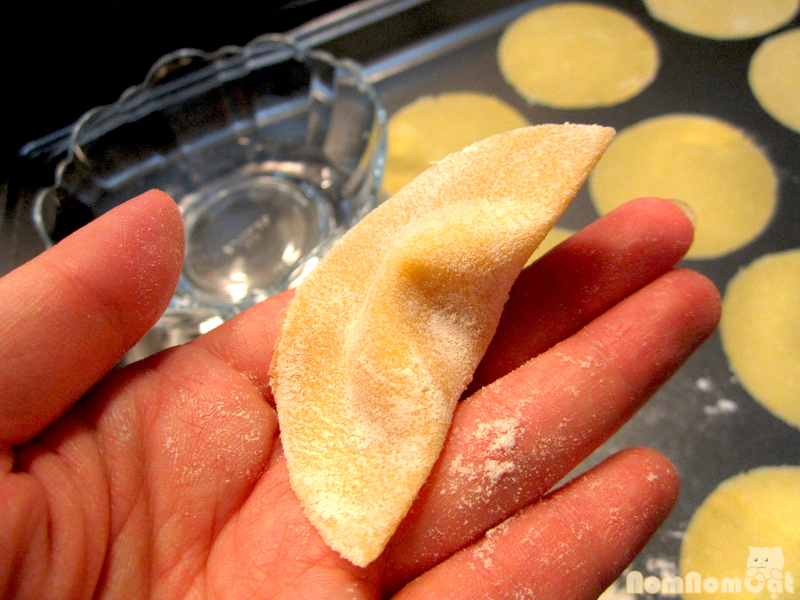 Agnolotti, ravioli, tortellini, just to name a few — all of them seem to require so much skill! 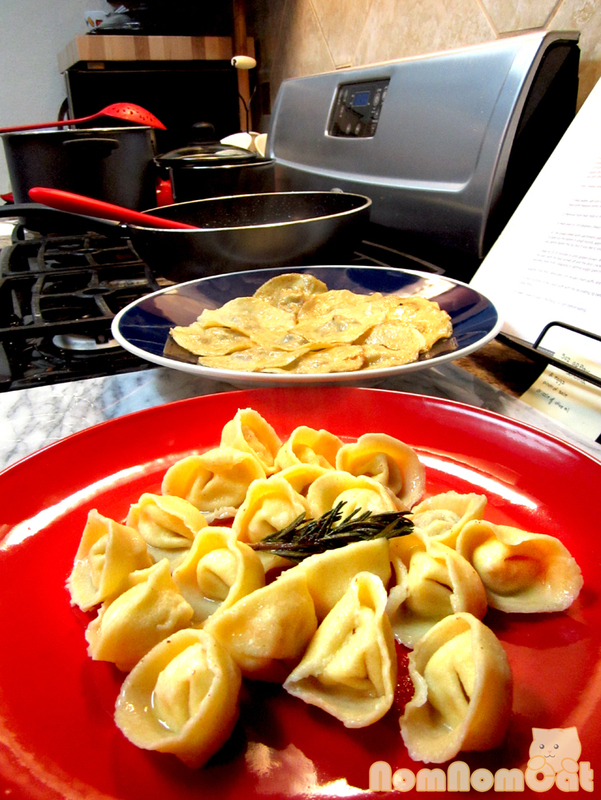 But this week, we decided to tackle tortellini and made plenty extra to freeze for future meals — it was a delicious success. We used our recipe from our very first blog entry on Nom Nom Cat. You’ll need 2-3 batches for the amount of filling below. 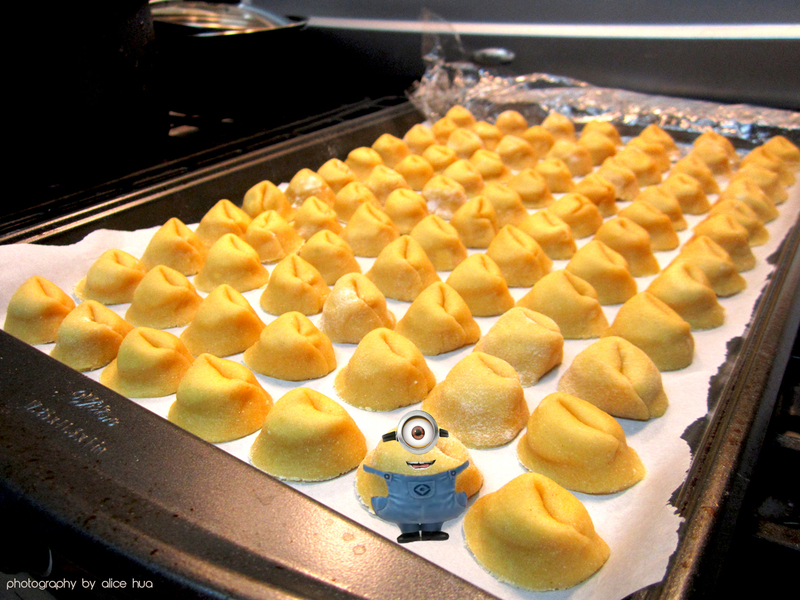 Recipe yields approximately 100 mini tortellini about the size of a quarter in diameter. 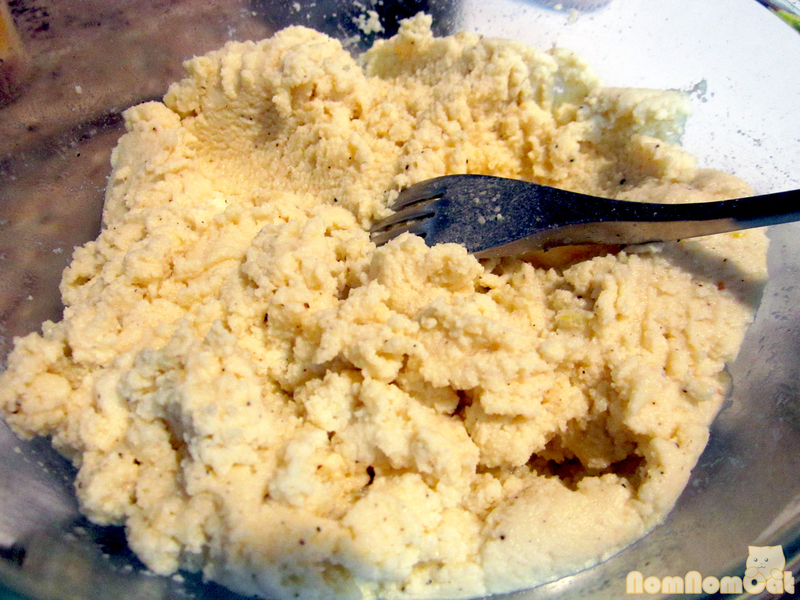 Mix together the ingredients for the pasta dough. Knead for a full 10 minutes to get the glutens working. Wrap the kneaded dough in plastic wrap and let rest for 40 minutes. Meanwhile, prepare the filling. In a medium-sized bowl, stir together the ingredients until combined. Our filling was a bit clumpy but that’s OK. Cover with a piece of plastic wrap, gently pressing it so that it touches the surface of the filling. Place in the refrigerator until ready to use. 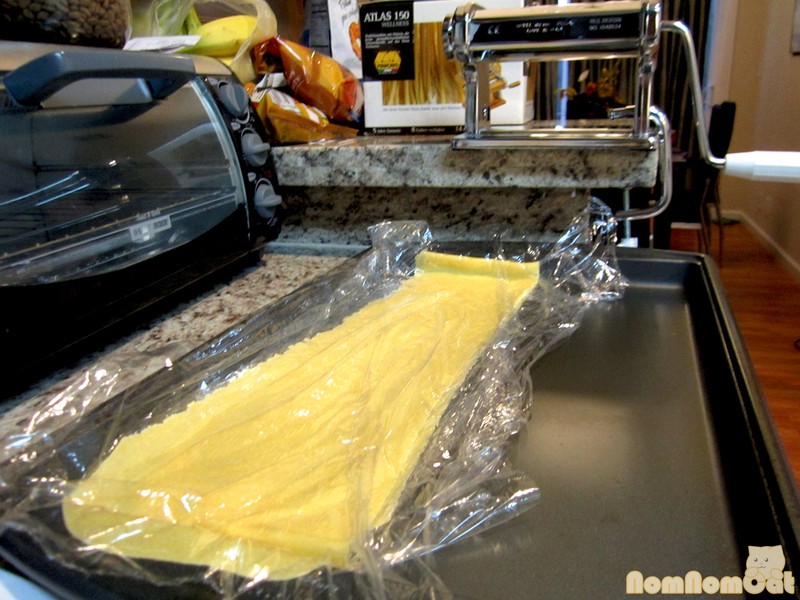 Roll out the pasta, 1/4 batch at a time, to a thickness of 7 on the Marcato. You’ll want to be able to faintly see your hand through the sheet of pasta. Cover sheets in plastic wrap or a moist towel to keep them from drying out. Use a cookie cutter or upside-down drinking glass to cut out even circles of dough. We used a 3-inch diameter tea cup. 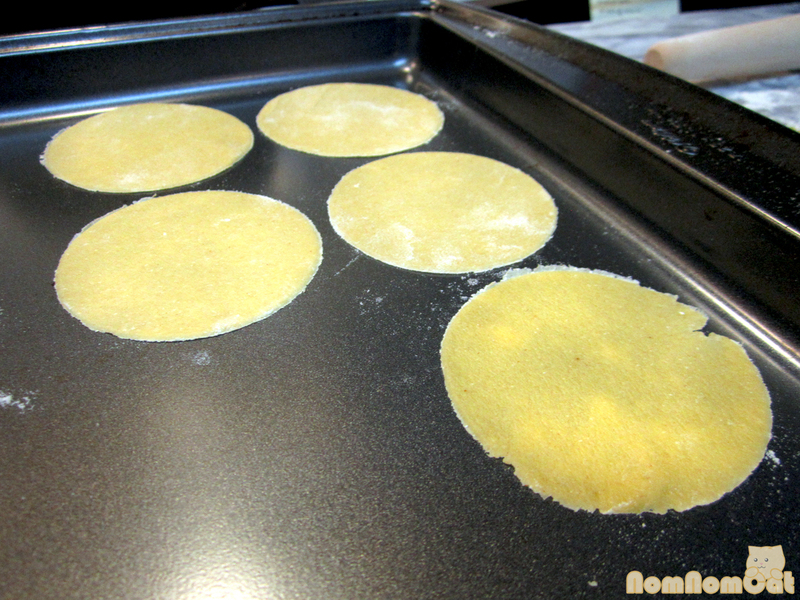 Lay out onto a lightly floured surface. Once you have a nice little collection of pasta ready to shape, grab a small bowl of cold water. Now for the fun part: gently lay one of the circles on the fingers of one hand. Top with a small dollop of filling. 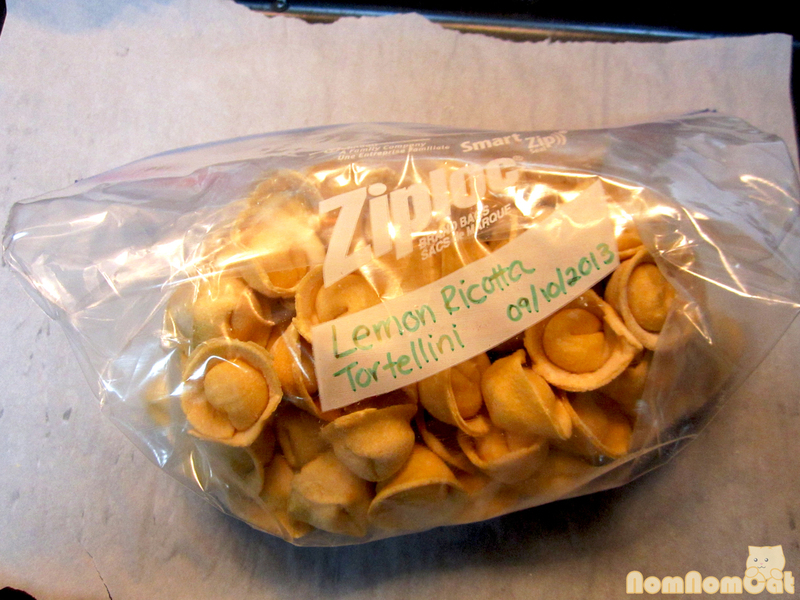 If you are making mini tortellini like we did, we used about 1/2 teaspoon of filling for each. Dip your finger in the water and lightly moisten the edge halfway around the circle. Next, fold over the dough so that the dry half overlaps the moistened half. 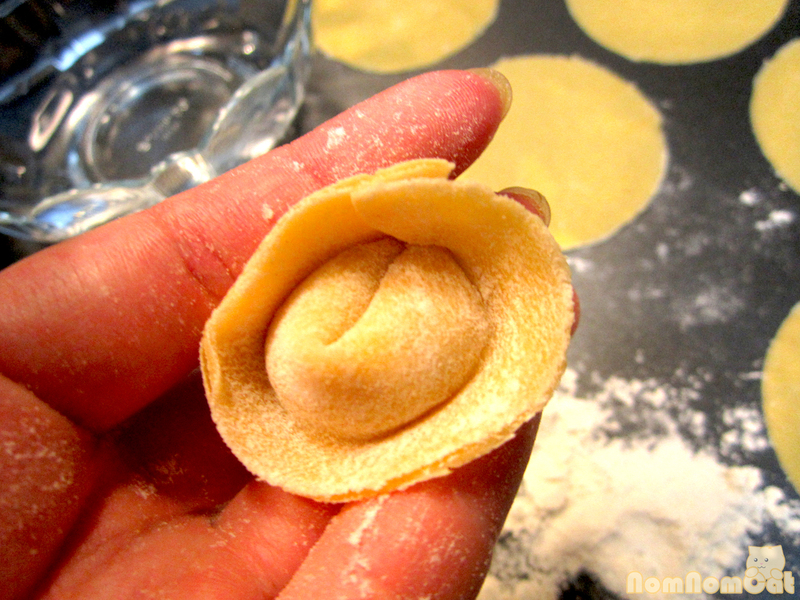 Gently press around the filling to avoid air bubbles (those will steam up and cause the tortellini to burst open during the cooking process) and continue to press outward to the edges. Use one finger to poke a dimple into the center of the filling. 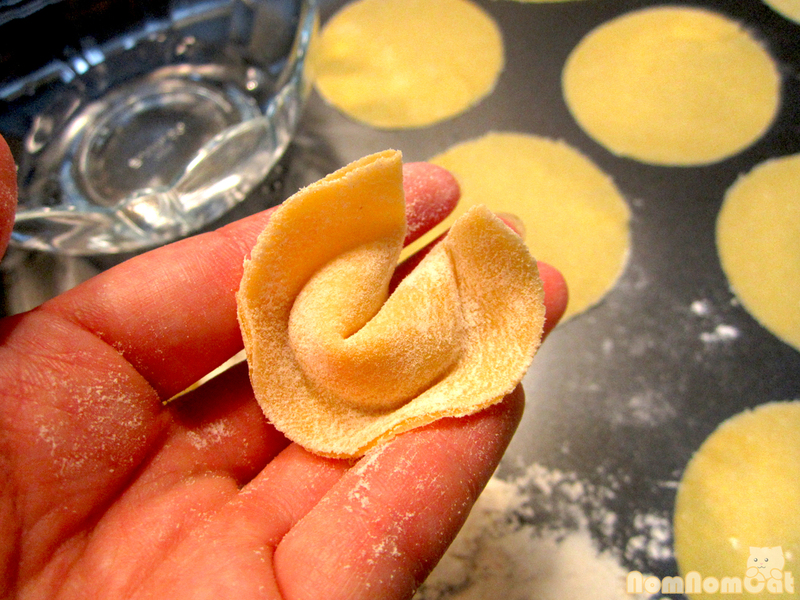 This will serve as the guide for shaping the tortellini. Using the dimple as the center point, pull the pointed tips toward each other. The flat edges should curl up like the brim of a hat and the dimple should help form a little point. 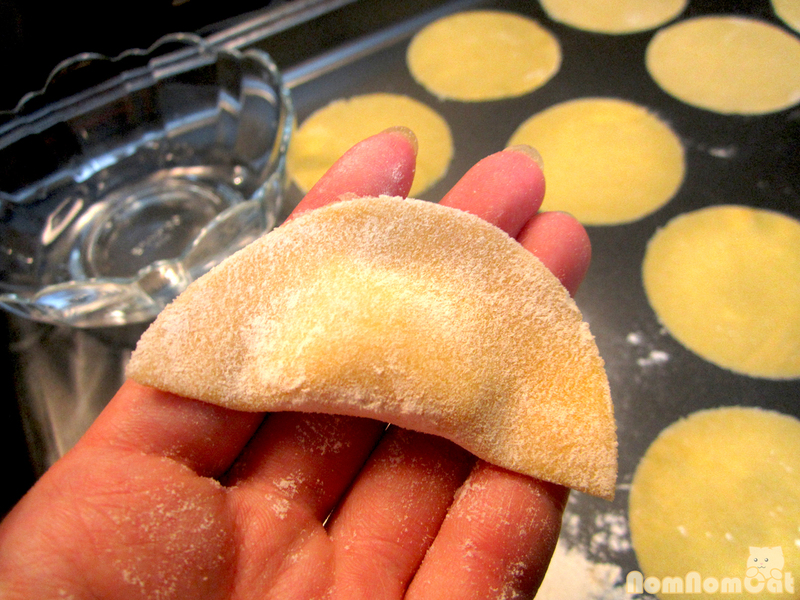 Press the overlapping edges together so that the dough is about even thickness as the rest of the pasta. This will help ensure even cooking later (if the junction is too thick, then it will be hard when the rest of the tortellini has reached al dente or mush). Arrange your finished product on a baking sheet lightly dusted with flour. We were intending to freeze ours, so we lined our baking sheet with parchment paper. Placing them in straight rows like a pasta army is optional. Cooking them is easy. If you are serving them immediately after making, simply cook them in salted boiling water. When they float, give them another minute or so before fishing them out with a slotted spoon. Taste one if you’d like – the pasta should be al dente. We transferred our pasta immediately from the water to a pan of brown butter and rosemary sauce, although that turned out to be a bit rich. A better option, in our opinion, is a drizzle of your favorite olive oil (we used Global Gardens meyer lemon oil) and chopped basil. Refreshing and truly brings out the lemony filling! 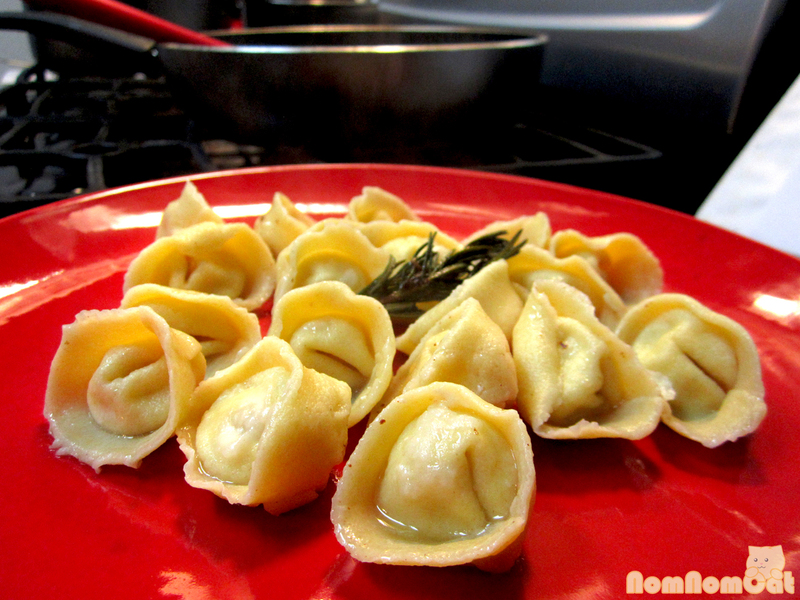 To save for later, let the tortellini freeze at least overnight on a baking sheet in a single layer. After they have hardened, transfer to a resealable plastic bag, label, and store. 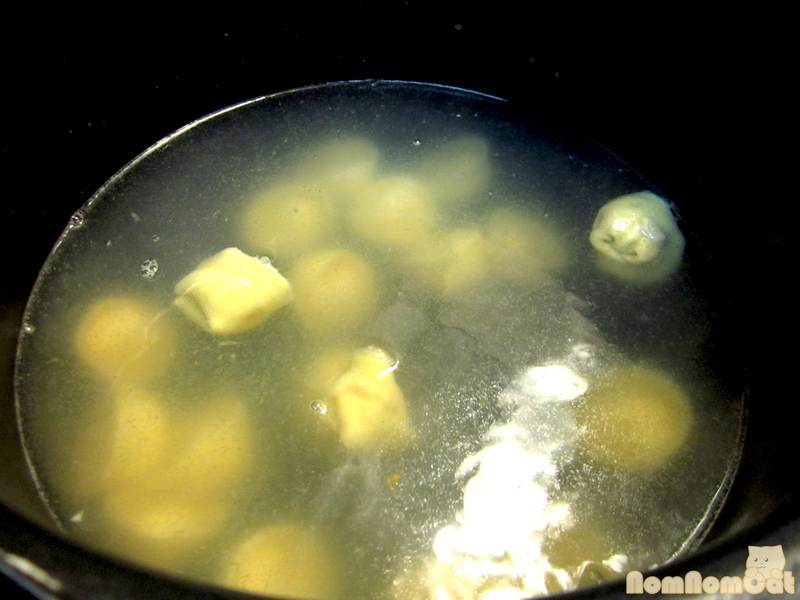 For an easy weeknight dinner, simply boil up water. 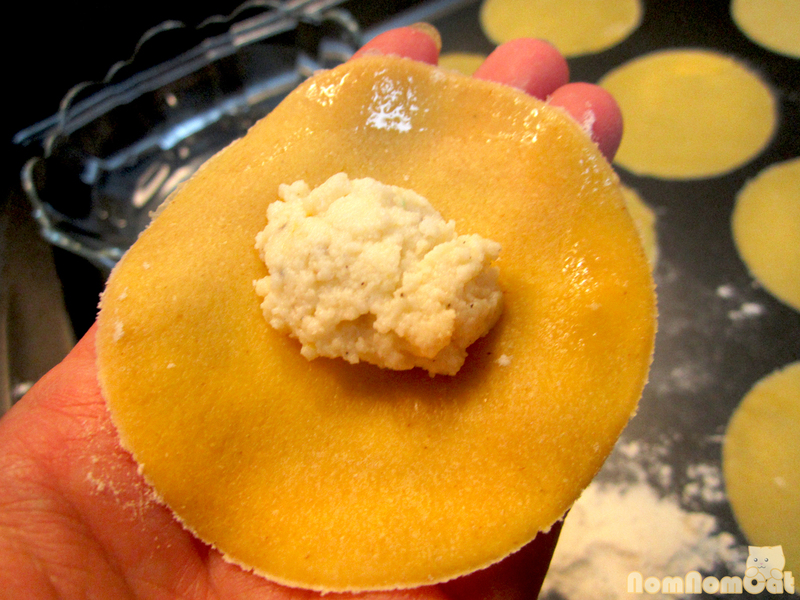 Season with salt and toss in a handful or two of tortellini. Watch until they float and then wait another 2-3 minutes, about 5-7 minutes altogether. The filling will have heated through and the pasta will be nice and al dente. Serve with a sauce of your choice. And a little Photoshop fun for our dear readers… I couldn’t resist! This post is part of the monthly link up party Our Growing Edge. This event aims to connect food bloggers and inspire us to try new things. Making homemade tortellini is certainly a challenge but one that we are so proud to have overcome. We hope that you too will try your hand at folding these little buggers. It was a fun project that turned out to be hours of quality time together in the kitchen. And after your hard work, there’s no feeling quite like the satisfaction of digging into a bowl of fresh pasta made by your own hands. This month is hosted by Marnelli at Sweets & Brains. Like this link-up? Keep your own Growing Edge in mind — we’ll be hosting in October! Thanks, Genie! Definitely – making pasta is an awesome hands-on couple activity. :3 Cheers!